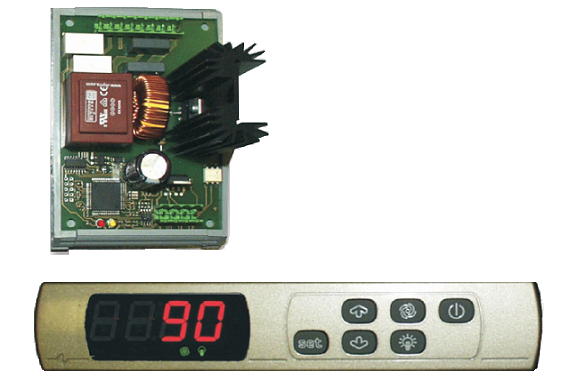 • 2 digital outputs (relays) for light and a possible gas electric valve management; each relay rating is 5 A @ 250 VAC. 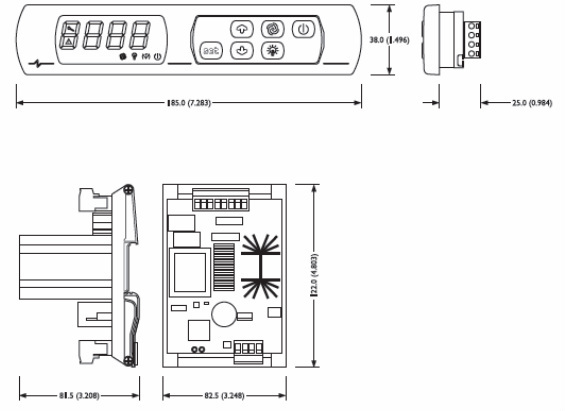 The device is available in "split" execution (user interface + control module).The user interface looks in case 185 x 38 mm (7.283 x 1.499 in) and is made of a 4 digits custom display (with function icons) and 6 buttons (set, up, down, fan speed up, light and on/stand-by); installation is by panel, with two screws Ø 2.9 mm (0.114 in) or M3. The control module looks in open frame board; installation is on DIN rail. further outputs: 1 cut phase output for fan speed regulation.